When in the course of human events it becomes necessary to write a guest article for my good friends at MarketingProfs, I figured the patriotic approach would be the right one in honor of America's big 2-3-9: I thought I'd pay homage to one of the most well known and effective pieces of content ever drafted—one written with quill and ink rather than on a MacBook keyboard. That's right, the Declaration of Independence, a timeless document that reached millions and quite literally changed the world. No viral videos, no hashtags, no email, tweets or shares: simply some of the most powerful and beautifully composed words ever recorded. 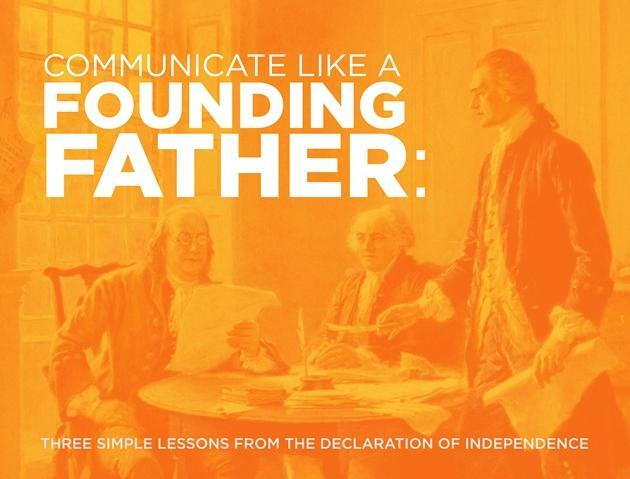 And believe it or not, the Declaration of Independence follows a simple formula dating back thousands of years to one of the original thought leaders about the art of persuasion, Aristotle, who called it Ethos, Pathos, and Logos. Today we've adapted this method as Know, Feel, and Do (KFD). Despite how incredibly simple this approach may seem, too many people get it wrong. They think this method doesn't apply to them or their industry, and they leave crucial elements on the chopping block. So I thought I'd take it upon myself to show how one of the most powerful and revolutionary pieces of communication ever written follows the KFD framework. Brian Burkhart is on faculty at Northwestern University and the founder of SquarePlanet Presentations. He's a sought-after coach of TED speakers, Shark Tankers, and business leaders.